This event report was kindly submitted by Alistair McNaught, Accessibility Inclusion Specialist at JISC and one of the presenters at the AAG Seminar this year. This year’s accessibility seminar felt ‘all grown up’ as if a milestone had somehow been passed. 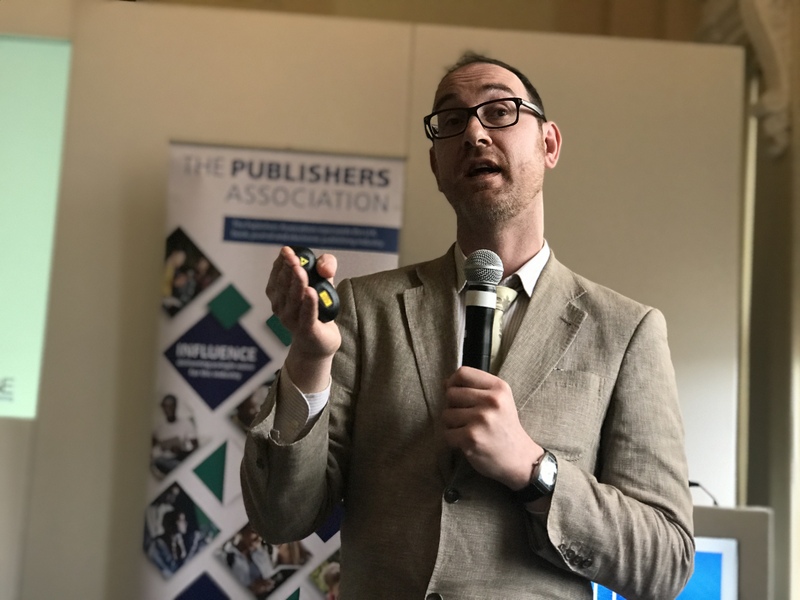 There were, in fact, two major milestones – the 10th anniversary of the Publishers Association Accessibility Action Group was one. The 150th anniversary of the RNIB was – appropriately – the other. But the sense of maturity was more than a sense of age; it was also a sense of accomplishment. The Accessibility seminar has consistently fielded a great line-up of topics. Usually, there’s an element of aspiration, a sense of what the future could look like or signposts pointing towards it. This year’s topics went further. They were all about now; the tools you can use now, the publishers who are now prioritising accessibility and the information universities and colleges need now to help inform their support for disabled students. Emma House, Deputy Chief Executive of Publishers Association and long-time coordinator of the Accessibility Action Group, introduced and chaired the session. Richard Orme (CEO of the DAISY Consortium) introduced the new ACE by DAISY tool. Whilst EPUB 3.1 – the latest version of the EPUB standard – is the most accessible format yet it “has enough flexibility that it’s still possible to inadvertently create inaccessible content”. The ACE by DAISY checker examines a file and reports on WCAG accessibility issues, metadata (especially the accessibility metadata), outline structure, image descriptions etc., and creates a report on the file’s accessibility, complete with contextualised links to a knowledge base. A complementary tool – SMART, the ‘Simple Manual Accessibility Reporting Tool’ takes the outputs from ACE and configures a test plan for manual review. Finally, a Reading Systems evaluation protocol has been developed to check the accessibility of the reading system your file might end up being delivered through. This allows publishers to make recommendations for readers about the tools to use (or maybe the ones to avoid). 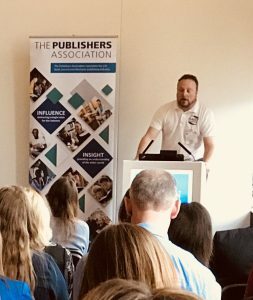 Finally, Richard reminded the audience of the Inclusive Publishing website – a hub for advice and guidance on best practice for accessible content. So, with a highly accessible file format (EPUB 3.1), free tools to audit your content, a tool to evaluate the platform destinations and a knowledge hub… the barriers to being an accessible publisher are lower than ever. 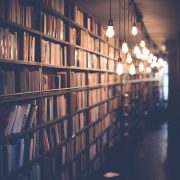 Alistair McNaught, one of Jisc’s accessibility and inclusion specialists, launched the ASPIRE project, a collaboration between publishers, aggregators and university libraries to provide plain English information on the accessibility features of e-book files and delivery platforms. The project provides the publishing industry with two months advance notice of a crowd-sourced audit of publisher and aggregator accessibility statements. If you don’t know what disabled customers need to look for the ASPIRE website will give you an excellent overview. If you do know, it helps focus your efforts on making the information available in an easily discovered way. The thrust of Alistair’s session was that “even if your accessibility isn’t great, knowing what does and doesn’t work allows disability support staff triage problems and prioritise solutions.” Alistair, a lactose-intolerant vegetarian, claimed that it is “easier to find out whether a £1.99 pie is suitable for my dietary needs than it is to find out if an ebook collection, costing thousands, is suitable for a dyslexic’s study needs”. The ASPIRE project should help the industry to make such inequality a thing of the past. 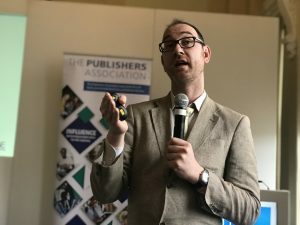 Luc Audrain (Head of Digitalisation, Hachette Livre) is not just an ‘early adopter’ but potentially the very first to incorporate the ACE by DAISY tool into a mainstream publisher workflow. 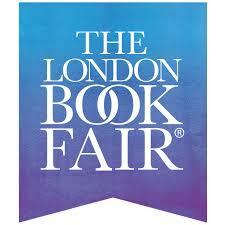 This achievement earned Hachette an Inclusive Publishing award two days earlier. 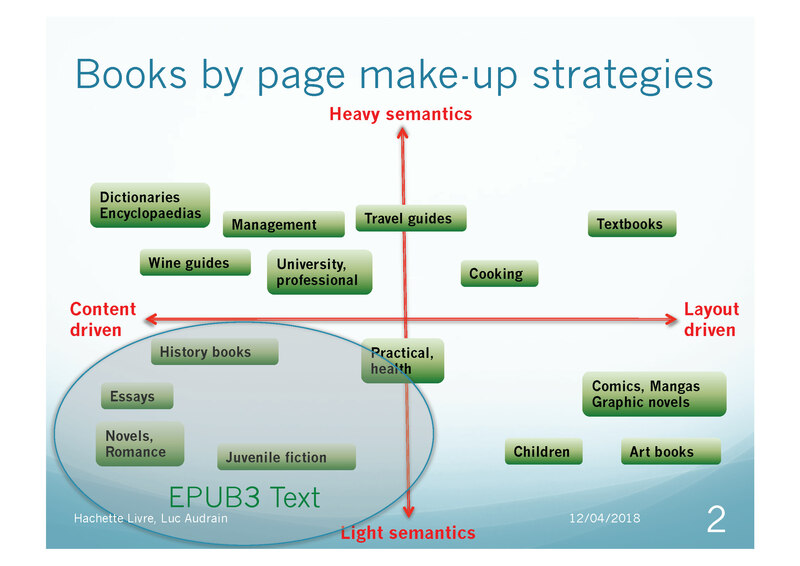 Luc started by identifying a spectrum of publication types depending on their semantic structure and whether they are driven primarily by content or layout. Plotting these on a scattergraph proved a fascinating way of identifying a range of accessibility opportunities and challenges. Hachette’s work involved adapting their current workflows for fiction books to create “born accessible” EPUB 3. For this category of books, Hachette defined a specific profile of EPUB 3 they called “EPUB 3 Text”. 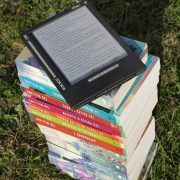 The choice of EPUB 3 format was down to several factors including, a better user experience, better typographic layouts, better accessibility, a modern web technology with full market support. In 2016 Hachette tweaked their existing workflows so that the page layout XML fed an EPUB 3 work stream with epubcheck validation, and at the beginning of 2018, they have added accessibility validation using ACE by DAISY. don’t be afraid of small steps, enough small steps lead to a big change for the user. Don’t be lonely. Learn from others, network and seek help. Stand on the shoulders of giants. Emma House wrapped up the session and reminded us that it was the RNIB’s 150th anniversary and the Accessibility Action Group’s 10th anniversary. The journey has not yet ended. But we’ve made a good start.